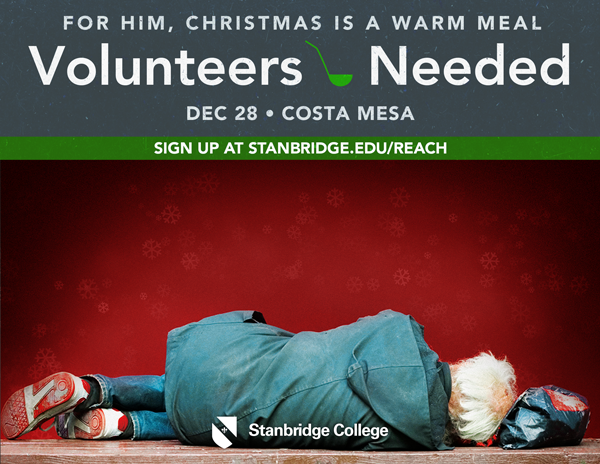 Stanbridge College REACH – Beyond the Classroom is looking for volunteers to help the homeless in December. Hundreds of homeless, low-income and elderly people and families can’t afford or aren’t able to have a holiday celebration. But together, we can help make their Christmas season a little warmer. Volunteers are needed to help sort and distribute free groceries and household items to those in need at the Free Pantry Organization. The Free Pantry Organization also encourages donations of jars of peanut butter to offer to the needy. Time: 8:30 a.m. – 12:30 p.m. Volunteers are needed to help prepare and serve a warm meal to homeless and low-income people and families on December 28th. Volunteers will also assist with distribution of holiday gifts to those in attendance. It may be the most wonderful of time of the year, but for thousands on the street it is another day of trying to find food and shelter. Help them understand the true meaning of Christmas.